If you have been wanting to try out some Georgian cuisine the Batumi Piazza is where you will get the best. A quaint square with multiple cafes and restaurants, this is where you can bask in Batumi’s essence at its best. Perfect to visit during a warm afternoon or a pleasant evening for a wholesome Georgian or European meal, the piazza is an amalgamation of spectacular architecture, unique cafes and a brilliant clock tower that offers a 360-degree view of this elegant city. If you are lucky, you can also get to witness a musician playing an instrument or two! A place where you can just spend the day-in at one of the cafes or restaurants indulge in devouring food, with a good book to read along with some good music playing in the background. However, you might have to wait for a little longer than you expected as the customer service can tend to be a tad slow. But if you are in no hurry, sit back and relax! You might have to wait longer than you expected, as the customer service is a little slow. Don’t be surprised if your table is dodged by a waiter, for reasons unknown. How popular is Batumi Piazza? People normally club together Europe Square and Argo Cable Car while planning their visit to Batumi Piazza. People also prefer to end their day with Batumi Piazza. 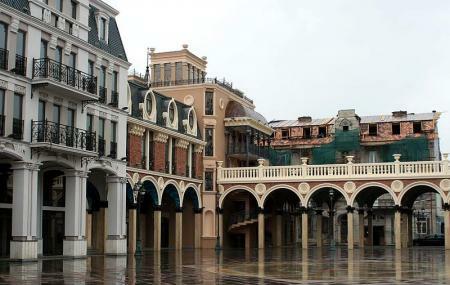 Seems like a small replica of Piazza San Marco from Venice.It is not bad, it's cozy but that's it. Many European style restaurant, the clock with some figures dancing every 3 hours. But everything looks fake. Great place to relax and have fun! Nice place to chill and have lunch or drinks.